There was a time, when the vintage clawfoot, freestanding baths were the only of their kind around. However, with the advent of time, various other types of bathtubs have found their way in the market to join the bandwagon. Yet, they have failed to overwhelm the appeal of those good old freestanding baths. If you are still pondering over what makes these beauties timeless classic, it is their ability to add some drama to your bathroom, which does the trick. These freestanding baths are deeper than the other traditional built-ins and this allows a far more relaxing and laid back bathing experience. While the built-in tubs are still popular, these freestanding beauties can add a tinge of drama to your bathroom, thereby creating a focal point that matters the most! That is where we at Direct Tile and Bath chip in! We add that much sought-after ‘wow’ factor to bathrooms with our collection of freestanding baths that are timeless beauties – to say the least! So are you on the same page with us and are you looking forward to adding that drama to your bath? Here are a few ripper ideas that will make your day for sure! While a white classic freestanding bath in Perth would be dramatic enough, adding some shades to the focal point of your bathroom will always be something daring! So why not deviate from the norms and be slightly daring by adding some extra shades to your bathing beauty? It will surely do something to the style quotient that will add to the overall glamour of your bathroom. Maybe the newly introduced one, with black exterior and white interior sidewalls will create that sharp contrast that will add that dramatic effect you are looking for! 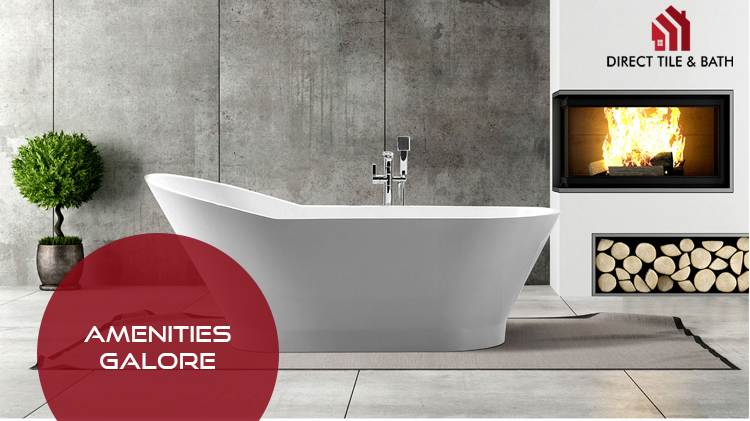 Are you more into using modern cutting-edge technology in your soaking bath atmosphere? Then it’s time for you to rejoice! Our freestanding tubs have the provision of adding all those latest accessories that will let you have that ultimate bathing experience! Then again, if you are not into those technological widgets, you can opt for the traditional small baths of Perth that we have in our kitty. The traditional freestanding variety will add a lot to your relaxing and laid-back lifestyle with subtle ease and delicacy. You know, even simplicity can at times add a lot of drama. When people think of more drama, they think of things that more eye-catching, bold and more vibrant. This at times is wrong! Drama more often than not can be felt even with minimal ornamentation and some drop-dead simplistic lines. It is so true in case of the freestanding baths we at Direct Tile and Bath offer! The freestanding baths we have are sleek and extremely minimalistic in structure and form and are left without any clutter whatsoever around them. However, that does not deter them from being the focal point of all the drama that your bathroom can play with. Think of offset simplistic lines with barely a couple of features like a sleek pendant or a gorgeous chair – and they are enough for the drama to unfurl! Therefore, now that you are so sure of adding the tinge of drama to your bathroom, it is your call now to choose from the wide plethora of varieties that we offer from Direct Tile and Bath. Select the one that will suit your style and choice and of course your bathroom and add a new edge to your bathing experience!